The West End’s temperature is set to soar this summer as seven brothers with model good looks and killer dance moves make their London stage debut. Now it’s London’s turn to fall under their spell as they premiere Los Vivancos: Aeternum, a good-versus-evil story set in the world of the paranormal and supernatural with the brothers playing angels, demons and vampires, at the London Coliseum for one night only on Tuesday July 9.
classical sounds. Los Vivancos play instruments on stage and are joined by seven female musicians, the Maszka Band, from Budapest. With costumes ranging from traditional to contemporary and lots of bare flesh on show, Los Vivancos: Aeternum is a spectacular, unforgettable production. As young boys growing up around the world, Aaron, Cristo, Elias, Israel, Josué, Josua and Judah Vivancos learned to play instruments and created exciting acrobatic routines to show off their talents in special performances for their family. After graduating from the Professional Conservatory of Dance in Barcelona they went their separate ways to study with international dance companies, including in England, Canada, France and Holland. 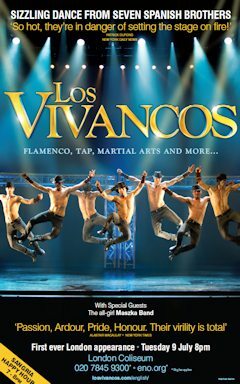 They reunited back in Spain in 2006 and formed Los Vivancos. Today the group has grown into an award-winning global brand that has seen the band of brothers perform in 73 cities in 34 countries. Now they have the West End in their sights!